Download "SPIN MASTER CORP. CHARTER OF THE AUDIT COMMITTEE"
1 SPIN MASTER CORP. CHARTER OF THE AUDIT COMMITTEE 1. 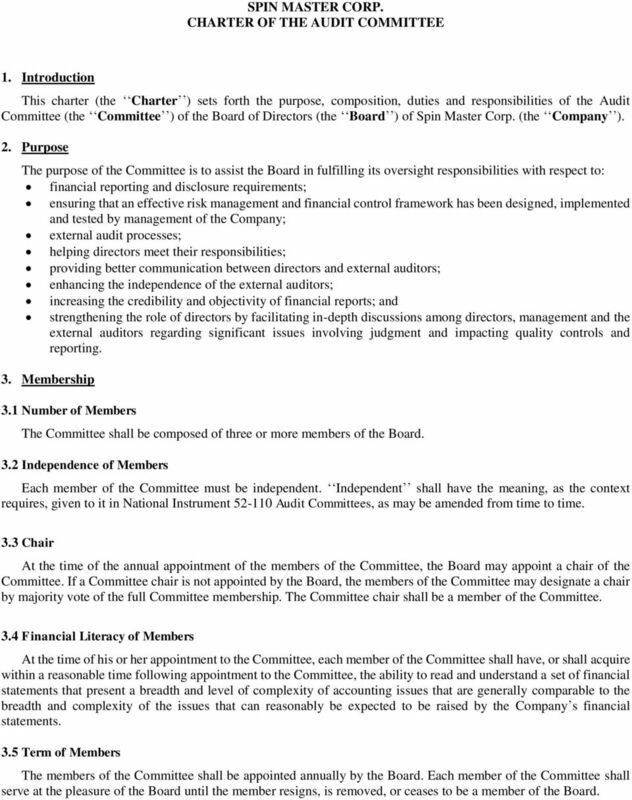 Introduction This charter (the Charter ) sets forth the purpose, composition, duties and responsibilities of the Audit Committee (the Committee ) of the Board of Directors (the Board ) of Spin Master Corp. (the Company ). 2. Purpose The purpose of the Committee is to assist the Board in fulfilling its oversight responsibilities with respect to: financial reporting and disclosure requirements; ensuring that an effective risk management and financial control framework has been designed, implemented and tested by management of the Company; external audit processes; helping directors meet their responsibilities; providing better communication between directors and external auditors; enhancing the independence of the external auditors; increasing the credibility and objectivity of financial reports; and strengthening the role of directors by facilitating in-depth discussions among directors, management and the external auditors regarding significant issues involving judgment and impacting quality controls and reporting. 3. Membership 3.1 Number of Members The Committee shall be composed of three or more members of the Board. 3.2 Independence of Members Each member of the Committee must be independent. Independent shall have the meaning, as the context requires, given to it in National Instrument Audit Committees, as may be amended from time to time. 3.3 Chair At the time of the annual appointment of the members of the Committee, the Board may appoint a chair of the Committee. If a Committee chair is not appointed by the Board, the members of the Committee may designate a chair by majority vote of the full Committee membership. The Committee chair shall be a member of the Committee. 3.4 Financial Literacy of Members At the time of his or her appointment to the Committee, each member of the Committee shall have, or shall acquire within a reasonable time following appointment to the Committee, the ability to read and understand a set of financial statements that present a breadth and level of complexity of accounting issues that are generally comparable to the breadth and complexity of the issues that can reasonably be expected to be raised by the Company s financial statements. 3.5 Term of Members The members of the Committee shall be appointed annually by the Board. 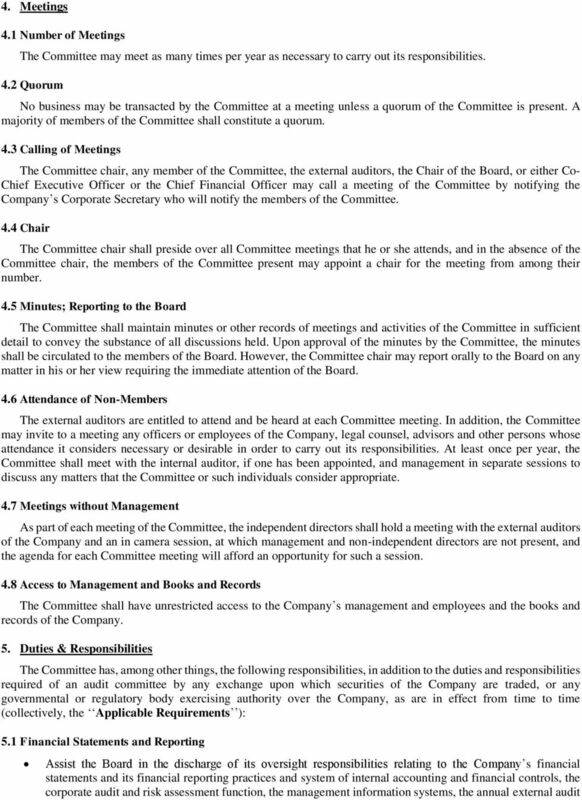 Each member of the Committee shall serve at the pleasure of the Board until the member resigns, is removed, or ceases to be a member of the Board. 3 of the Company s financial statements and the compliance by the Company with laws and regulations and its own Code of Ethics and Business Conduct related thereto. Review significant accounting and reporting issues, including complex or unusual material transactions and highly judgmental areas, unusual or sensitive matters such as disclosure of related party transactions, significant non-recurring events, significant risks and changes in provisions, estimates or provisions included in any financial statements, and recent professional and regulatory pronouncements, and understand their impact on and presentation in the financial statements. Review and discuss with management and the external auditors the results of the audit, including any difficulties encountered and follow-up in that context and ensure that the external auditors are satisfied that the accounting estimates and judgments made by management s selection of accounting principles reflect an appropriate application of generally accepted accounting principles. 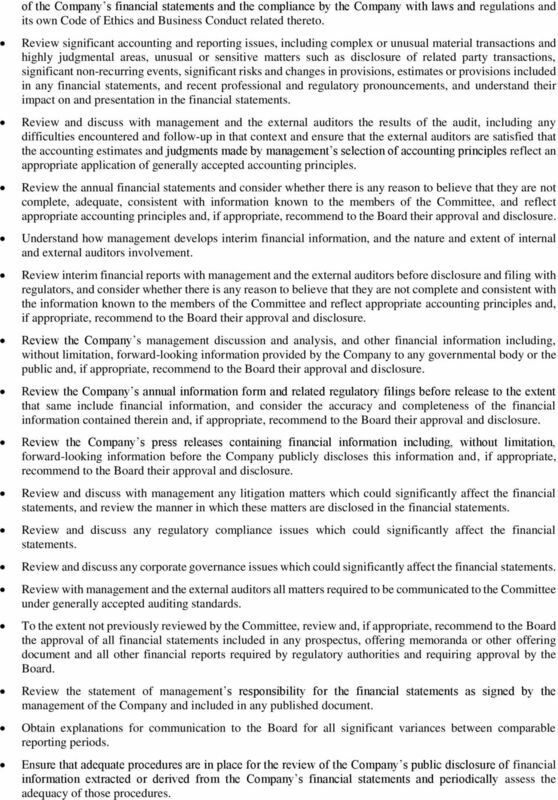 Review the annual financial statements and consider whether there is any reason to believe that they are not complete, adequate, consistent with information known to the members of the Committee, and reflect appropriate accounting principles and, if appropriate, recommend to the Board their approval and disclosure. Understand how management develops interim financial information, and the nature and extent of internal and external auditors involvement. Review interim financial reports with management and the external auditors before disclosure and filing with regulators, and consider whether there is any reason to believe that they are not complete and consistent with the information known to the members of the Committee and reflect appropriate accounting principles and, if appropriate, recommend to the Board their approval and disclosure. Review the Company s management discussion and analysis, and other financial information including, without limitation, forward-looking information provided by the Company to any governmental body or the public and, if appropriate, recommend to the Board their approval and disclosure. Review the Company s annual information form and related regulatory filings before release to the extent that same include financial information, and consider the accuracy and completeness of the financial information contained therein and, if appropriate, recommend to the Board their approval and disclosure. Review the Company s press releases containing financial information including, without limitation, forward-looking information before the Company publicly discloses this information and, if appropriate, recommend to the Board their approval and disclosure. Review and discuss with management any litigation matters which could significantly affect the financial statements, and review the manner in which these matters are disclosed in the financial statements. Review and discuss any regulatory compliance issues which could significantly affect the financial statements. Review and discuss any corporate governance issues which could significantly affect the financial statements. Review with management and the external auditors all matters required to be communicated to the Committee under generally accepted auditing standards. To the extent not previously reviewed by the Committee, review and, if appropriate, recommend to the Board the approval of all financial statements included in any prospectus, offering memoranda or other offering document and all other financial reports required by regulatory authorities and requiring approval by the Board. Review the statement of management s responsibility for the financial statements as signed by the management of the Company and included in any published document. Obtain explanations for communication to the Board for all significant variances between comparable reporting periods. Ensure that adequate procedures are in place for the review of the Company s public disclosure of financial information extracted or derived from the Company s financial statements and periodically assess the adequacy of those procedures. 4 Monitor the application and update, as necessary, of the Company s disclosure policy in relation to financial information. 5.2 Internal Control Review the Company s system of internal controls. Require management to design, implement and maintain appropriate systems of internal controls in accordance with Applicable Requirements, including internal controls over financial reporting and disclosure and to review, evaluate and approve these procedures. At least annually, consider and review with management and the Company s external auditors: the effectiveness of, or weaknesses or deficiencies in: the design or operation of the Company s internal controls (including computerized information system controls and security); the overall control environment for managing business risks; and accounting, financial and disclosure controls (including, without limitation, controls over financial reporting), non-financial controls, and legal and regulatory controls and the impact of any identified weaknesses in internal controls on management s conclusions; any significant changes in internal controls over financial reporting that are disclosed, or considered for disclosure, including those in the Company s regulatory filings; any material issues raised by any inquiry or investigation by the Company s regulators; the Company s fraud prevention and detection program, including deficiencies in internal controls that may impact the integrity of financial information, or may expose the Company to other significant internal or external fraud losses and the extent of those losses and any disciplinary action in respect of fraud taken against management or other employees who have a significant role in financial reporting; and any related significant issues and recommendations of the external auditors together with management s responses thereto, including the timetable for implementation of recommendations to correct weaknesses in internal controls over financial reporting and disclosure controls and procedures. Recommend and supervise the establishment and operation of an internal audit process. 5.3 External Audit Recommend to the Board the appointment or discharge and compensation of the Company s external auditors. Oversee the work of the external auditors, including the auditors work in preparing or issuing an audit report, performing other audit, review or attest services or any other related work. Fill the role as the direct contact for the external auditors and manage the relationship between the Company and the external auditors. Maintain a free and open line of communication with management, the Chief Financial Officer and the external auditors. Resolve disagreements between the external auditors and management as to financial reporting matters brought to the Committee s attention. At least annually, discuss with the external auditors such matters as are required by applicable auditing standards. At least annually, review a summary of the external auditors proposed audit scope and approach, including coordination of audit effort with internal audit. Review a report prepared by the external auditors in respect of each of the interim financial statements of the Company. 6 other information required by applicable law. The Committee should also review any other report the Company issues that relates to the Committee s responsibilities. 8. Delegation The Committee may, to the extent permissible by Applicable Requirements, designate a sub-committee to review any matter within this Charter as the Committee deems appropriate. 9. Access to Information and Authority The Committee will be granted access to all information regarding the Company that is necessary or desirable to fulfill its duties and all directors, officers and employees will be directed to cooperate as requested by members of the Committee. The Committee has the authority to retain, at the Company s expense, independent legal, financial and other advisors, consultants and experts, to assist the Committee in fulfilling its duties and responsibilities, including sole authority to retain and to approve and pay any such firm s fees and other retention terms without prior approval of the Board. The Committee also has the authority to communicate directly with internal and external auditors. 10. Limitation on Committee s Duties; No Rights Created Notwithstanding the foregoing and subject to applicable law, nothing contained in this Charter is intended to require the Committee to ensure the Company s compliance with applicable laws or regulations. In contributing to the Committee s discharge of its duties under this Charter, each member of the Committee shall be obliged only to exercise the care, diligence and skill that a reasonably prudent person would exercise in comparable circumstances. Nothing in this Charter is intended or may be construed as imposing on any member of the Committee a standard of care or diligence that is in any way more onerous or extensive than the standard to which the members of the Board are subject. This Charter is a statement of broad policies and is intended as a component of the flexible governance framework within which the Committee functions. While it should be interpreted in the context of all applicable laws, regulations and listing requirements, as well as in the context of the Company s Articles and By-laws, it is not intended to establish any legally binding obligations. 11. Review of Charter Periodically, the Committee shall review and assess the adequacy of this Charter to ensure compliance with any rules of regulations promulgated by any regulatory body and recommend for Board approval any modifications to this Charter as considered advisable. WEATHERFORD INTERNATIONAL plc AUDIT COMMITTEE CHARTER Approved: September 25, 2015 Purpose The purpose of the Audit Committee (the Committee ) is to assist the Board of Directors in overseeing the: 1. 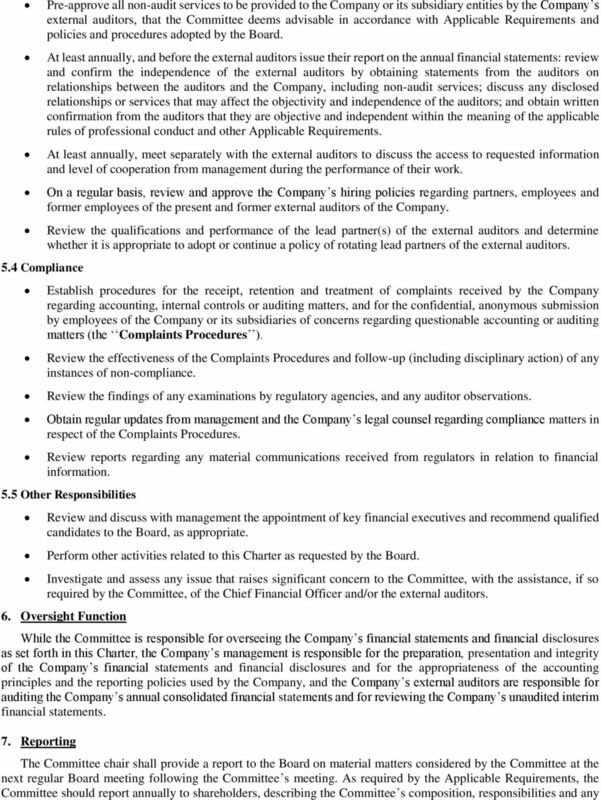 CHARTER OF THE AUDIT COMMITTEE OF THE BOARD OF DIRECTORS OF INTERCONTINENTAL EXCHANGE, INC. 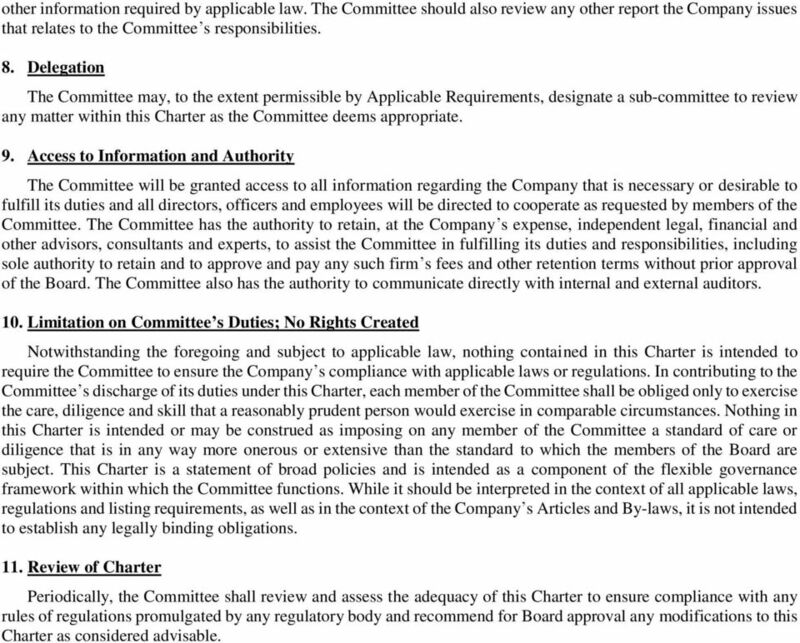 AUDIT COMMITTEE CHARTER. of ForeScout Technologies, Inc.
DTE ENERGY COMPANY AUDIT COMMITTEE CHARTER Purpose The purpose of the Audit Committee is to assist the Board of Directors in its oversight of the: 1. 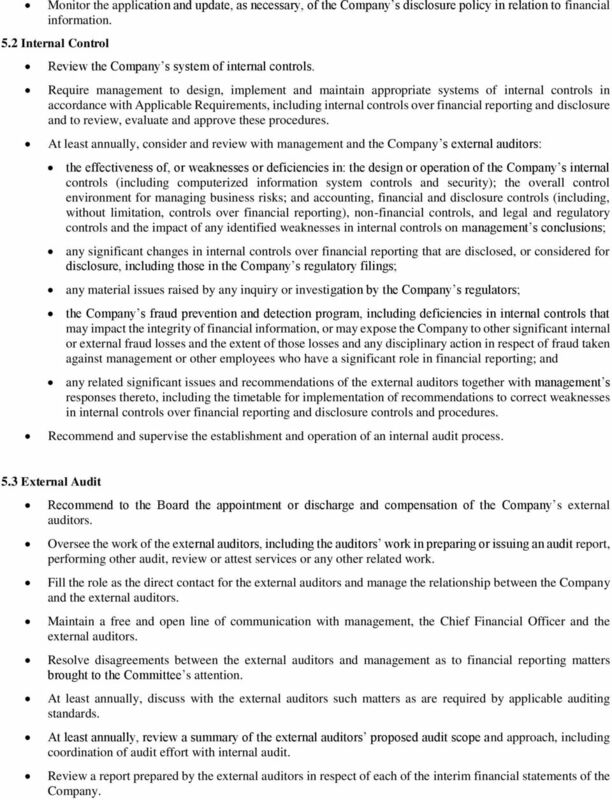 Integrity of the Company s financial statements; 2. MANDATE OF THE AUDIT COMMITTEE FOUNDERS ADVANTAGE CAPITAL CORP.
CHARTER FOR THE AUDIT COMMITTEE OF THE BOARD OF DIRECTORS PERVASIVE SOFTWARE INC.
CHARTER OF THE AUDIT COMMITTEE OF THE BOARD OF DIRECTORS OF LIVE NATION ENTERTAINMENT, INC.
073007 LEAPFROG ENTERPRISES, INC. AMENDED AND RESTATED AUDIT COMMITTEE CHARTER The role and responsibilities of the Audit Committee (the Committee ) of the Board of Directors of LeapFrog Enterprises, Inc.
Charter of the Audit Committee of Asterias Biotherapeutics, Inc.